On July 18, Muk Muk left Belden in the late evening and began the long climb up out of the Feather River gorge. She passed the burned-out remains of the Williams cabin and continued on another mile to Myrtle Flat where she stopped for the evening as it was getting dark. As no rain was forecast, Muk Muk cowboy camped for the night, meaning she didn’t put up her tent. As she was snuggling in her sleeping bag, she heard a rustling in the brush near the trail leading to her camping spot. At first she thought it was another hiker approaching, but after calling out to the noise, and getting no answer, she became a little concerned. 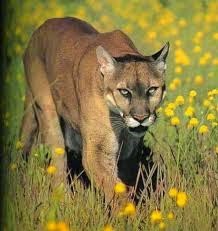 Shining her headlamp in the direction of the disturbance, she became very alarmed when she saw the reflection of her light in the two bright orbs of a large mountain lion staring back at her. She shouted at the animal and banged her trekking poles together in hopes of frightening it away, but it stood its ground. This display, this Mexican standoff lasted for about an hour – Muk Muk shouting, hissing, and growling at the big cat, all the while the cougar simply ignoring her and her antics. After a bit, the cougar left, and Muk Muk took the opportunity to erect her tent. Now seated inside her flimsy shelter that was meant only for keeping mosquitoes and rain at bay, she waited to see what would happen. She didn’t have to wait long, as the cat reappeared outside her tent. In the dark, Muk Muk thought there might be two cougars, but she was never sure. For several hours this cat-and-mouse game played out; Muk Muk shouting and yelling, the cat growling and hissing outside the tent. Muk Muk’s anxiety level was rising by the minute; she’s frantic, not knowing what to do, not knowing what the intentions of the cougar are. Attacks on humans by cougars are extremely rare, but not unheard of. Will the big cat try to enter the tent? Or is it content to just inflict emotional pain on a very scared and frightened hiker. Certainly, this isn’t the cat’s first rodeo, its first stalking of a human. Muk Muk carries a Spot emergency responder and tracking device with her. She debates whether or not to activate the emergency SOS signal that will be relayed to the sheriff’s department nearest to her location and the fact that she needs assistance. In her somewhat confused state of mind, she can’t decide if it’s the proper thing to do. She debates and debates with herself, until finally her fears and anxiety are so great, at one thirty in the morning, she presses the SOS button on the tracking device; in a split second the signal, carrying her unique frequency and code, and GPS location flashes out to the overhead satellite and is relayed back to an earth station, for processing. A human voice then calls the local sheriff’s department responsible for the section of forest land in which Muk Muk is located. The administrative machinery for a search and rescue operation has now been set in motion and the waiting begins. Muk Muk is extremely tired but dares not sleep; she sits upright in her tent, facing the door, holding her trekking poles in one hand with the sharp ends pointing towards the door, and her tiny knife with a two-inch blade in her other hand. She waits and frets; she dozes. Time passes slowly; has the mountain lion left? She can’t be sure, but she no longer hears any movement or sounds outside her tent. At four in the morning, she determines that the big cat has left, and sends a cancellation notice for the SOS signal. The blinking lights on the Spot say that the message has been sent, but she cannot be sure. With the light of day, Muk Muk unzips the tent door and peers out; no sign of the cougar. She exits the tent carrying her trekking poles in defensive mode, prepared to do battle, but the cougar has gone; it’s had its fun. In the early morning hours she hears the whooshing sounds of a helicopter overhead. When she sent the SOS signal, her latitude and longitude coordinates were piggybacked with the same message, thus, search and rescue personnel knew exactly where to start looking for her. Although the tree cover was dense, she was still able to get the attention of the helicopter pilot and spotter and gave them the OK signal, accordingly, the rescue helicopter left the area. Unbeknownst to Muk Muk, two search and rescue personnel had started up the trail from Belden when they received notice of an impending emergency. They were able to make contact with her before she left the area. Muk Muk, as a hiking community of friends who care about you, we’re glad that this unexpected experience had a happy ending, and now gives you some bragging rights. A mountain lion, also know as a Cougar, and sometimes referred to as a Panther.